Chanting Hare Krishna attentively is extremely easy, but wanting to chant Hare Krishna attentively is in fact very difficult. Maybe I would reply with something about how incredibly cool, attractive, hypnotic, and breathtaking Krishna is – “All-Attractive.” But honestly, I think that is too abstract for times like this. And somehow I just don’t get the opportunity to really hear enough Krishna Kathā directly about Vṛndāvana Līlā for this to really blossom in my heart. That’s damn sad. Its a crime. But it is what is. Yet I can talk about something else here, which is real and practical and immediate: I want to develop a relationship with Krishna because… Well, the reason boils down to Absolute intimacy. Absolute intimacy and oneness is what all relationships hunger for and strive towards, yet it is impossible when the partners are two different beings. A relationship with Krishna is a relationship with the root of Paramātmā, a being who is not different from the ātmā (at least not in the same way that Sally is different from Joe). The ātmā is an āṁśa of Paramātmā, like sunlight is a portion of the sun. The absolute root of the self (ātmā) is the superself (paramātmā). Since Krishna and I are not fundamentally separate entities, absolute intimacy is a real possibility, not just a hypothetical ideal. I want a relationship with Krishna because I want a relationship with my real self, my deepest self, the very root of who and what I am; I want a relationship with Krishna because I want a relationship with reality – not just apparent reality, temporary reality, fragments of reality – but the whole of reality, and the truth of reality. By chanting Hare Krishna carefully I have tasted some of what I seek, some absolute intimacy with the root of everything. And it’s that taste, and the wanting for more of it, that addicts me to the sometimes tiresome effort of trying to chant Hare Krishna. You seriously think a relationship with a concept like “Krishna” is more attractive and more intimate than a relationship with real people? I’ve pursued this relationship with Krishna for a couple of decades now, and I’ve come to realize that it’s not just a concept or ideal. It is something with tangible taste, feeling, color, shape, etc. This is mystical, and pragmatists would therefore write it off as dreaming. But then, still, so what? We are all in various stages of dreaming. 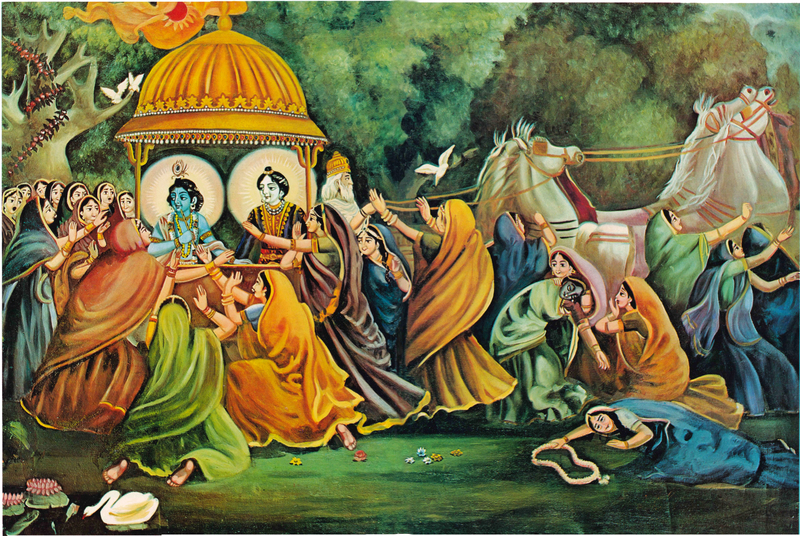 Even if its just a dream, a relationship with Krishna is the best dream I’ve heard of. There is also something more practical and tangible that even pragmatists might appreciate. Over the years I have gradually realized that my relationship with Krishna generates a very tangible effect on my relationships with “real” people in the “real” world. By becoming more intimate with Paramātmā, I become more intimate, friendly and open with everyone. Indeed, through relationship to the superself, I can sometimes experience some hint of oneness and absolute intimacy with other selves as well, other ātmā, because they are rays from the same sun as I, leaves from the same root as I. What does chanting have to do with establishing a relationship? Firstly, because the mantra being chanted is what it is – a collection of names. Names invoke a person. By calling a name I call to a person. By relating to a name I relate to a person. By relating to “Hare Krishna” I relate to Rādhā Krishna. How do you “relate” to the name? I relate to it in absolute femininity: absolute receptivity and facility. I am consciousness, the name is the enjoyer of consciousness, the object of consciousness, the focal point of consciousness. I am the field, the name is the plow and farmer. I am the womb, the name is the seed and the seed-giver. I am the śakti the name is the śaktimān and śaktīśvarī. The name is the absolute male, śaktimān, always desiring enjoyment. I am absolute female, absolutely enjoyable – śaktī. And the goddess of femininity, śaktīśvarī, accompanies the name to direct my coordination with the symphany of bliss she conducts for śaktimān. It is just japa. It is just the name, and my consciousness. But this is what it means to give my consciousness to the name, and hold none back for my selfish use. This is the realtionship formed by the simple, easy act of chanting a name with affectionate attention. So, what’s the problem? Why is it “difficult to want to chant Hare Krishna”? A women whose husband abuses her often stays with him simply because she is habituated and doesn’t know how to break that habit and achieve any other type of life for herself. I am used to loving my own ego. I am used to employing my consciousness to think about the things I want to prove, disprove, explain, accomplish, overcome, etc. It does not give me what I want, but I don’t really know how to do anything else. I’m not used to absolute femininity, absolute pure love, absolute intimacy. That’s why its difficult, and that’s why I need things like japa beads in the first place – to count and make strategy and try to measure progress. I think this is also a big reason why śaktīśvarī Rādhā is everpresent in the mahāmantra. We need her guidance, we need a transmission of power-realization from her, so that we can understand this new way of living – where consciousness is purely devoted to its ultimate source. Previous Is the Ācārya Relative? This article affected me so deeply, I feel as though it was written by my own heart, and said everything that speaks to my heart, directly. Thank you for sharing your incredibly sincere and profound “heart-mind”. How can I learn more about Krishna and chanting? Do you know of any good resources?